Remember Disc Cameras from the 1980s? Here’s how to get those Disc Film Negatives digitized . . . I laughed because I am also sitting on many of these “disc camera film negatives” from photos that my mother took over 30 years ago. If you aren’t familiar with these negatives or the disc cameras that used disc film cartridges, click HERE for a good explanation over at Wikipedia. What made these cameras so special, and popular? The Good: they were easy to use, the film was easy to load, held 15 or 30 exposures, the film size was light and 40% of the common 110 film. The Bad and The Ugly: the photos were often grainy and not very good. This was due to most photo labs using the wrong equipment when processing the negatives. Although most consumers had given up on disc cameras by the end of the 1980s, Kodak still manufactured disc film up until 1997. And believe it or not, there are still some labs that will process disc camera film or make reprints from disc camera film negatives!! And talk about weird . . . you could buy a “selfie stick” back in 1983 for the Minolta Disc-7 camera! Can You Really Scan a Disc Camera Film Negative Yourself? Yes you could scan disc film negatives using either a flatbed scanner or a special multimedia scanner like the Jumbl that scans standard film negatives. The process is described in detail HERE. If you have the Epson Perfection scanner (an amazing combo flatbed/multi-media scanner) you can purchase an adapter for disc film negatives. But I caution you: it will be slow and tedious, plus since you are dealing with images on a “circle” you will likely need to rotate the final image and do some cropping. TIP: View your disc camera film negatives BEFORE you either scan them yourself or send them away for scanning! You may want to purchase a loupe stand magnifier (they are only $4.99) or a dome magnifier to examine each image. I am a big fan of outsourcing certain types of work like scanning photos, negatives and other items. However, I am VERY PARTICULAR about the vendors I use! Did you know that many scanning companies – even your local vendors – will send your items overseas for scanning? 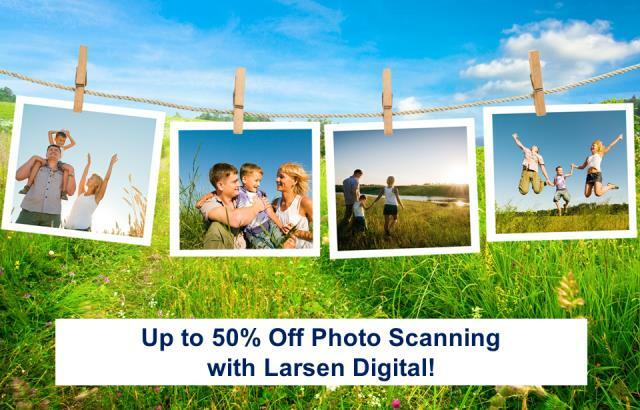 Plus, Larsen Digital will also perform basic color correction for your scans! Regularly $30* per disc negative, now just $20! Sale valid through Wednesday, February 13th! Click HERE to get started! *These rates may seem high, but a survey of current pricing at labs that still process disc film or make reprints from negatives indicates that the $30 price is standard. PLUS many labs don’t indicate whether they are using the 6-lens Kodak processor or the standard 3-lens processor which results in grainy and poor quality photos. Smarter Genealogy is a TOTALLY FREE resource and open to everyone. The goal is not just to make you a better genealogist, but to also increase your productivity and efficiency. Many of the skills available at Smarter Genealogy can also be applied at the office, church, and anywhere you use a computer! You can help support Smarter Genealogy by 1) shopping at Genealogy Bargains or DNA Bargains when you need the best prices on DNA, genealogy, and family history products and services OR take a look at the offers below! If you want to be notified by email when the next video like this on is available, sign up for my Genealogy and Technology E-news HERE.